One of my favorite art fairs in NYC. It was founded in NYC in 2008 and is the American incarnation of the leading emerging art fair founded in Basel in 2005. Volta NY is an invitational show of solo artists’ projects. There was an exciting amount of variety and style, however, still resonating with me is the work of Jin Joo Chae. 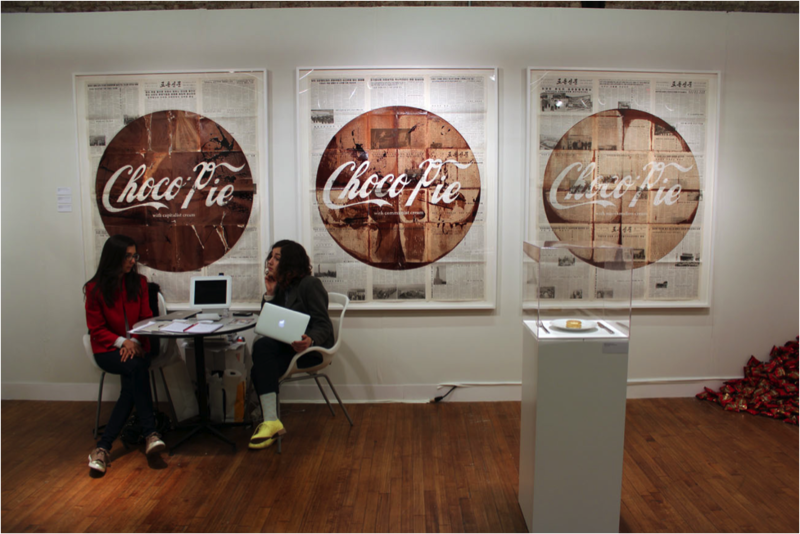 JIN JOO CHAE: From left, “Choco Pie with Capitalist Cream (Milk Chocolate),” (milk chocolate and chocolate syrup on North Korean newspaper); “Choco Pie with Communist Cream (Semi-Sweet Chocolate),” (semi-sweet chocolate and chocolate syrup on North Korean newspaper); and “Choco Pie with Marshmallow Cream (Bittersweet Chocolate),” (bittersweet chocolate and chocolate syrup on North Korean newspaper) all 2014 by Jin Joo Chae at Julie Meneret Contemporary Art in New York.